Doing research in Greece these past five months since the January elections, and especially during the week since the referendum was announced, has been a bit like living in a twilight zone in terms of the shamelessly imbalanced coverage of the negotiations by the international media; the proliferation of bad or just plain wrong information; and the violent production of stereotypes that continue, frequently, to frame Greece and Greeks as a stubborn, stupid, if brave people who do not want to take responsibility for their own failings; or as “lazy,” committed only to having a good retirement and not working too much. Sure, there have been some more nuanced pieces in the international press, and in many parts of Europe and the world we have also witnessed not just a growing sympathy but a solidarity with Greek people. But it remains simply amazing how such stereotypes have persisted, in the face of what we can assure the reader is growing and intense poverty across generational and political lines in Greece; absolutely extraordinary responses at the grassroots level in Greece to manage and respond to this poverty; as well as the almost eerie calm and dignity with which our Greek neighbors, friends, and acquaintances have greeted not just the referendum but the ever-likely exit from the Eurozone. And still, these stereotypes persist. Just this morning, when the future of Greece and Europe remains tenuously on the table, we were greeted by an Italian opinion piece in the Corriere, written by a supermarket mogul (why they asked such a person for a comment is an open question), with the headline: there is a crisis “because Greeks don’t work” (non lavorono). Just last night, during a discussion about the current situation here, involving an international group of scholars and young people, a multi-lingual, educated young man from the Italian south was brave enough to ask (in front of many smart, multilingual, active Greek young people who have left their homes for work and study elsewhere in the world): why do we still see Greek young people in cafes? Why are they not going elsewhere and working hard to look for “success” as he has done? So, these sentiments continue – and they are propagated not just by moguls who do not know the first thing about Greece, but even by smart, educated individuals from the marginalized south. We don’t want to belabor this point or complain too much about the terrible injustice of it all. But based on the work we have conducted while living here for the past few months (and after an 11 year involvement in Greece), we might have the following to offer: a short account of how Greek people are working hard – in a powerful voluntarity movement founded on the idea of allileggii (or solidarity) – to respond to the urgent needs of neighbors, family, and others who find themselves in positions of abjection under austerity. “Solidarity” has emerged as a powerful discourse of the left in Greece during the debt crisis and the subsequent austerity measures. One can see this term used to describe such diverse activities as the institution for “e-inclusion” or ψηφιακή αλληλεγγύη [digital solidarity], a program to keep young people and people on the islands connected; to proclaim solidarity with prisoners in high security prisons; or with migrants in detention centers. And finally, domes allileggis, solidarity structures – grassroots level initiatives that seek to provide services such as food, housing, and medical care for Greeks and foreign residents alike in the face of both widespread poverty and overwhelming kena, or gaps, in state services. Since January, right after the election, I (Heath) have been conducting research on “social solidarity” pharmacies and clinics that have sprung up throughout Greece over the past few years in response to what might legitimately be called a healthcare crisis. These clinics collect and redistribute leftover pharmaceuticals from families, schools, and even other pharmacies (checking them carefully to make sure they are not expired). Networks of doctors provide free treatment in collaboration with the clinics, and in some clinics, doctors and dentists also see and treat patients. Not only are Greek hospitals understaffed and lacking in basic equipment and medicines, but with growing poverty and unemployment, Greeks have – en masse – found themselves outside the state healthcare system. There is, of course a much wider backdrop of ongoing global privatization and neoliberalization of the healthcare sector and the pharmaceutical industry that should also be taken into account (see Biehl 2005 on Brazil). Yet the current humanitarian crisis in Greece is deeply linked to austerity: since the Greek healthcare system is explicitly tied to employment (one of the needed reforms that the government, for instance, wants to focus on if it can ever leave the negotiating tables), unemployment has left many Greeks without access to that basic social right (valued in Europe at least) to healthcare. Moreover, with pension cuts, taxation, and the increasing prices of items basic for survival (such as food), many elderly people have found themselves having to decide, for instance, between bread (not even “food”) and medicine. And in the meantime, those young people who always seem to be such a target of disappointment (not just in Greece) are out there looking for work or working in precarious jobs in the hope that they might somehow get paid. Just the day after the referendum was announced I saw a group of young Greek women, fresh faced and wearing Vodafone T-shirts, heading out to stand in the hot sun all day to try to sell enough sim-cards and contracts to make their “quota” – which might allow them to get paid something at the end of the week. Surely not enough. I came to this project after ten years of research on the asylum procedure in Greece, and in particular, the role of the NGO sector in providing social and legal aid to asylum seekers and refugees (see On the Doorstep to Europe, 2014). My ethnographic engagement in Greece began in 2004, during the so-called “good years” following accession to the euro and the Olympic Games. By the end of my first research period (2013), Greece had entered deeply into the current period of financial precarity, austerity, and widespread poverty, when even many Greek citizens do not have access to basic social services. I thus began this new project asking how notions of belonging and community might be changing as “regular Greeks” increasingly find themselves in positions of extraordinary need and at the margins of social and political communities – in other words, not so unlike migrants, addicts, and others who have for years been marked as marginal. The very meaning of citizenship – as a framework of entitlement and social and political belonging – is stin aera, “in the air,” so to speak. That is, undecided and undetermined, up for grabs, offering new possibilities alongside its many limitations. One response to these problems of belonging and need has been the rapid growth of the extreme right in Greece and the increasing protection of “Greeks” over and against “foreigners.” It would be simplistic to reduce the widespread support for Golden Dawn to a mere “response to the crisis”; indeed, Golden Dawn has a relatively longstanding if marginalized history in Greece, as does an exclusionary brand of nationalism that coheres, in important ways, with long-standing aspects of Greek cultural and social practice (Herzfeld 1999) that, with the exacerbations of economic need, move easily into the terrain of fascism (see Tsimouris 2014; Avdela and Psarra). But particularly with the domestic political success of Syriza, we also see how the response of the left, framed again in terms of social and political SOLIDARITY, through and across lines of class, race, and gender, has also had a powerful hold in wider Greek society, taking on a life of its own so to speak – with multiple and contested meanings. 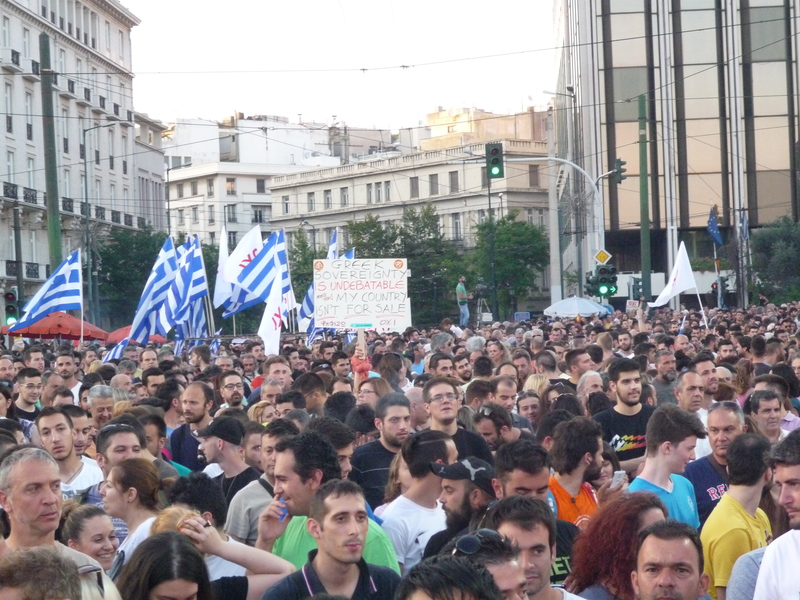 It is beyond the framework of this post to give an exhaustive history of the meaning of “solidarity” in Greece and, more broadly, in the west (see the outstanding current research of anthropologist Theodoros Rakopoulos on “solidarity markets” in Greece). Rather, here we want to underline a few overarching aspects of solidarity that have emerged from interviews and participant observation and both of our active involvement as volunteers in the pharmacies/ clinics (Heath) and solidarity kitchens (Salvatore). All of these aspects of solidarity are contested, and many research participants have questioned or openly critiqued how solidarity plays out in practice; many ask whether it is even an achievable social value. But there is a kind of consensus regarding how following aspects of how solidarity “should” work as an ideology and practice of social assistance and civic participation. 1) First, as a mode of grassroots social assistance, solidarity is unequivocally framed as lateral, anti-hierarchical, and based on similarities between persons – or at the very least, in the words of one volunteer, “empathetic” understandings between the person who receives support and the person who gives. As one volunteer explained, “today I am lucky, but tomorrow I may find myself in the position of the other.” In some instances the volunteer and the recipient may even be the same individual, such as the Albanian-origin volunteer who explained how he gives his time to collect food for others with a local solidarity network but then, “out of his own need,” receives medicine from the local social pharmacy. Many of these research participants explicitly frame solidarity as distinct from philanthropy, which many described as making yourself feel good through giving, and also as different humanitarian aid, which is based on a keno or gap between the giver and the recipient. 2) Second, solidarity is unequivocally framed as a form of voluntarism – ethelontismos. Most research participants and friends have highlighted that in giving they also receive something through a form of antalagi (exchange), either through a kind of thanks or appreciation, the experience of being useful, or spiritual or social elevation. But this is framed always as an immaterial benefit, not involving material profit or kerdos, and certainly not a misthos, wage. 3) Third, solidarity is framed by most to be filling in a temporary gap in social services as a result of austerity and state failure. In other words, solidarity networks are not only distinct from the state, but are distinct from non-profits, NGOs and other more longstanding institutional structures which provide services. For instance, as one clinic volunteer explained, the NGOs send their patients to us – why should NGOs get paid for the work that we are doing for free? There is great disagreement among participants in solidarity movements regarding the role of solidarity initiatives in the future: will they continue to provide assistance even if/ as the state seeks to reform its services and if the economy is allowed to recover? Will they take on an advisory role? Will they institutionalize themselves? Will they remain explicitly temporary and ad hoc, as one solidarity pharmacy/ clinic, where the primary organizer – himself a pensioner – seeks to respond to his community’s urgent need for pharmaceuticals without diverging from his party line (KKE – the Communist party in Greece) that the state must do this work, not the people? Within these solidarity pharmacies/clinics, solidarity speaks not just to visions of somatic or bodily health but also social health, regeneration, and community life – what some have described as “another face of crisis,” which highlights the creativity and strength of Greek communities in their response to austerity. In interviews with individual volunteers and visitors to the pharmacies/ clinics and kitchens, we frequently heard allusions to struggles of the past and earlier moments of violence and poverty and how these struggles had led to powerful forms of community response and solidarity. All of these interviewees lamented the current financial and social marginalization many face, and the urgent problems of bodily and social health that solidarity initiatives seek to address. But many also spoke of how this “other face of the crisis,” solidarity, is ameliorating the individualism, lack of engagement, and atomization wrought by the “good years” of neoliberal development; as well as the ways in which the interests of the private sector, finance, and capital continue to shape the future of not just of Greece – but the world. There is much going on in these solidarity movements that is complex, contradictory, and difficult to give account of here. But this is the long and the short of it: Greeks are working – hard. But they are very rarely paid for this work – these days at least. 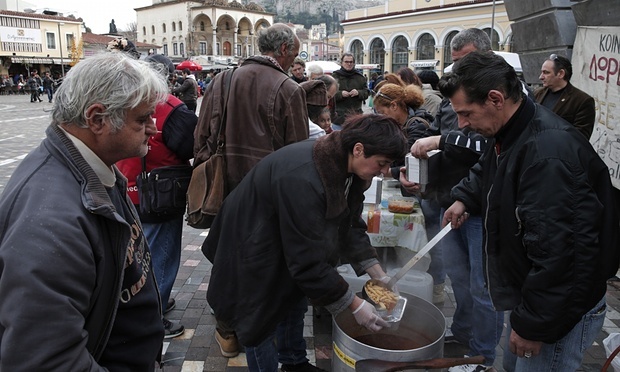 Pensioners, young people, and unemployed people have mobilized to provide for others at neighborhood and community levels, in ways that do not simply reinforce the structures of family and social networks that certainly play a powerful role in Greece, but speak to a wider vision of civic participation, democratic involvement and active citizenship in a time of often overwhelming need. Solidarity movements are just one way in which Greeks and others who live in Greece (i.e., long term and more newly arrived migrants) have responded heroically to the ongoing crises of austerity. And thank goodness, because as seems more and more likely, Greeks will continue to face these problems of poverty and unemployment – and as most recognize, things will likely get worse before they get better. The clear “NO” on the referendum was a NO to this Europe: a Europe that seeks to strangle single states with top-down “reforms” through decisions that are made far away from the reality of Greek people, and which have brought about a significant contraction of salaries and drastic unemployment, leaving ¼ of the population living below the poverty line. Tsipras’s government’s proposal to put an extra tax on the wealthiest, for instance, was simply refused by Brussels officials, a move that sought – again – to force the Greek state to have no voice with regard to how to tax its people in such a difficult moment in which everybody should be called to harsh sacrifices. Europe, as is it today, is not a federal state: policies are recommended, for instance, and states are supposed to comply with or to meet certain “common lines.” There is still the ongoing myth that member states are sovereign states – an expectation that is, very quickly, eroding. Using financial tools to /defacto/ force political and especially economic reforms in marginalized states is simply a way to impose a federalism that has never been discussed in a formal way. In asserting their sovereignty and the right to a democratic future, Greeks but have also called into question the meaning of Europe and the often hidden ways in which power relations continue to marginalize particular states, peoples, and ways of life. That is why a Grexit would be a defeat to the very idea of Europe as a common “house” or “family” for Europeans: it would be admitting that money rules over everything – over rights, over ideas, over people. If that happens, things will only get worse for the poor – a fast growing part of the population. Meanwhile, however, people and communities will continue to find ways of cobbling together meaningful lives: collecting the leftovers, scrounging not just for euros but for pharmaceuticals and food, rethinking ways of life and experimenting with other forms of exchange and distribution, to face whatever comes next. Heath Cabot is an assistant professor of Anthropology at the College of the Atlantic and the author of On the Doorstep of Europe: Asylum and Citizenship in Greece (Penn, 2014), as well as articles in journals such as American Ethnologist and Political and Legal Anthropology Review. Her areas of academic interest and expertise include migration, asylum, and humanitarian ethics in Greece and the European Union; the anthropology of organizations, NGOs, and cultures of advocacy; language, narrative, and translation; and urban memory. Salvatore Poier is adjunct professor of social theory at the College of the Atlantic. His areas of academic interest and expertise include Power, Authority, and Legitimation; Utopian movements and history of ideas; Cyber-crime and criminalization processes; Social resistance and counter hegemonic movements; Piracy. Readers can contact the authors at hcabot@coa.edu and spoier@coa.edu. Austerity vs Democracy: What’s Happening in Greece? 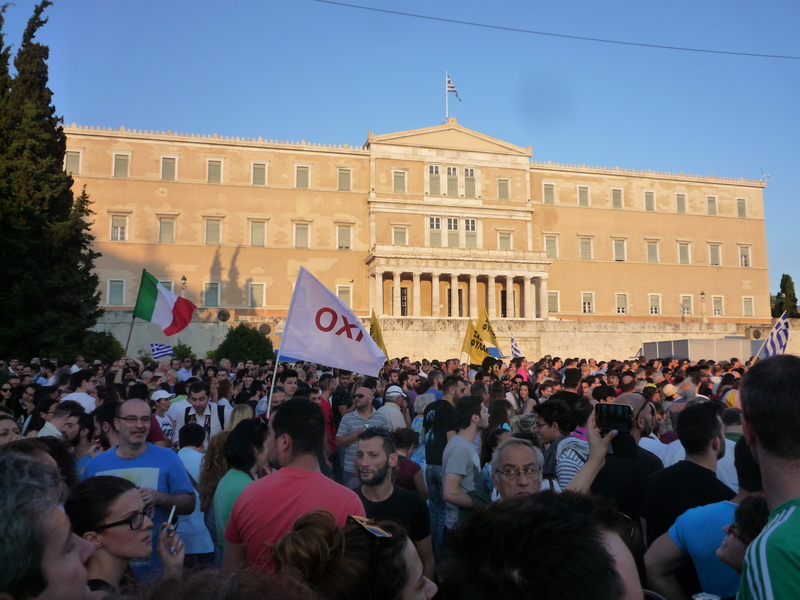 Prev Austerity vs Democracy: What’s Happening in Greece? Reblogged this on صحيفة جعفر الخابوري الا سبوعيه المستقله.